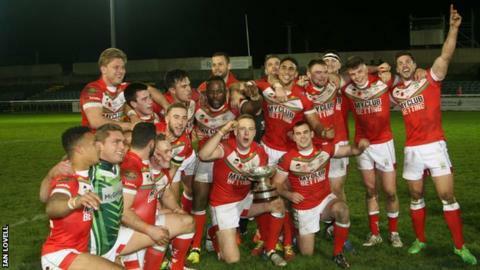 Wales secured the European Championship Rugby League title by beating Ireland 30-4 in Bray on Saturday. The Welsh, needing only a draw to clinch the European title for the first time in five years, all but secured victory by half-time with a 22-0 lead. Dalton Grant, Lewis Reece, Steve Parry and Rhodri Lloyd scored first-half tries for John Kear's Wales side. Elliot Kear added a second-half try for the visitors with Callum Mulkeen replying for Ireland late on. Courtney Davies kicked 10 points for Wales, whose victory secured them the title at the expense of France, who defeated Scotland 32-18 earlier on Saturday. Grant's try edged Wales ahead after Davies kicked a penalty deep into Irish territory. And after Liam Finn and Elliot Cosgrove had both threatened the Wales line, the visitors broke away for a second try when Reece reacted first after Casey Dunne had dropped a high ball. With Ireland wasting further promising attacking opportunities, they were made to pay with Parry and Lloyd both crossing for the Welsh before the break. Kear punished more poor Irish defending in the second half as Davies added to his haul of kicked points. Ireland's sole score came in the 72nd minute as Mulkeen touched down in the corner, but it was scant consolation for the well-beaten home side as Wales celebrated.